Philadanco marks its 40th anniversary with a new work that brings the funk. There is much cause for celebration surrounding The Philadelphia Dance Company's return to Pittsburgh Sept. 26-28. Not only will the company (a.k.a. Philadanco!) kick off its 40th Anniversary Jubilee Season here, but it will do so at Downtown's new August Wilson Center Theater. To celebrate both occasions, Philadanco offers a program of some of its best-loved works along with the world premiere of Urban Bush Women artistic director Jawole Willa Jo Zollar's "By Way of the Funk," co-commissioned by the Wilson Center and Philadelphia's Kimmel Center. "It's pretty good for somebody that is only 37," joked Philadanco founder and artistic director Joan Myers Brown, when asked about the company's anniversary. Brown (who is actually 77) spoke by phone from the company's Philadelphia studios. She started Philadanco in 1970 to give older students in her Philadelphia School of Dance Arts more performance opportunities in town. An aspiring ballerina in her youth, the Philadelphia native gave up those dreams because in the 1950s there were few, if any, opportunities for an African American to dance ballet professionally. Instead, Brown fashioned a career dancing in night clubs and on Broadway. 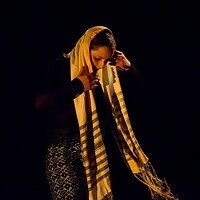 The lessons she learned from her own experiences -- like the value of stylistic versatility -- carried over to her students and, later, to her acclaimed company. 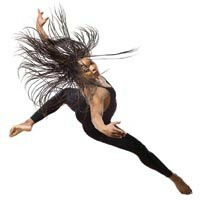 Primarily a touring company with a focus on African-American culture and a diverse repertory, Philadanco averages 40 weeks a year on the road across the U.S. and abroad. "I like to present dance that is exciting, joyous and intriguing," says Brown. "Our dancers are well trained and well rehearsed, and our programs are varied with broad audience appeal." Its program in Pittsburgh will begin with choreographer Gene Hill Sagan's neo-classical ballet "Ritornello," set to music by Johann Sebastian Bach. Brown describes the ballet as "light and pretty with lots of turning, lifts and beautiful movement." The company then trades "light and pretty" for downright fierce in hip-hop master Rennie Harris' "Philadelphia Experiment." An upbeat work set to a hip-hop beat, it summons the pulse of the "City of Brotherly Love." Zollar's world-premiere work opens the program's second half. Set in three sections for Philadanco's full 15-member ensemble, "By Way of the Funk" celebrates funk music by recounting its roots and paying homage to its heyday in the 1970s. "It started out as a ballet about American contralto Marian Anderson," says Brown. "But by the time she [Zollar] got to Philadelphia to work on it, she had changed her mind, choosing instead to do a ballet inspired by the music of Funkadelic and Parliament. It really is a fun ballet that the dancers love and I think audiences will love, too." 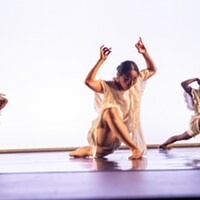 Last on the program is a work Brown calls her version of Alvin Ailey American Dance Theater's signature work, "Revelations": Christopher L. Huggins' "Enemy Behind the Gates." As with "Revelations," audiences now expect Philadanco to put the work on every program. While the success of "Revelations" derives from its depictions of hardship and its spirituality, "Enemy" succeeds with its relentless, take-no-prisoners intensity. Set to a driving score by composer Steve Reich, with blistering pace, physicality and an ominous undertone, the group work explores the notion of unrecognized enemies within our midst. Philadanco also performs for K-12 audiences at 10 a.m. Mon., Sept. 28, at the August Wilson Center ($7). Still spinning: Philadanco is on its 40th-anniversary season.